Elk are large members of the deer family, capable of reaching more than 1,000 pounds in weight and more than 4 feet in height. These social animals form aggregations of more than 400 animals in areas with plentiful food and cover. 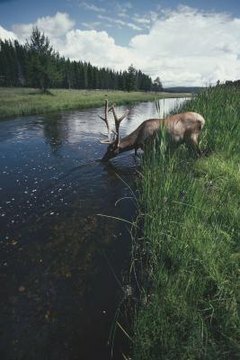 Despite conservation measures and reintroduction attempts, elk occupy only a fraction of their historic range; most people have to travel to remote wilderness areas to find these animals. Elk once ranged over most of the United States; but by the middle of the 19th century, humans had eradicated elk from most of the East. Formerly living as far south as central Georgia, Lousiana, Alabama and Mississippi, the eastern elk (Cervus elaphus canadensis) is now extinct. The only native deer that inhabits Georgia is the white-tailed deer (Odocoileus virginianus), though humans have introduced the fallow deer (Dama dama) in a few scattered locations.